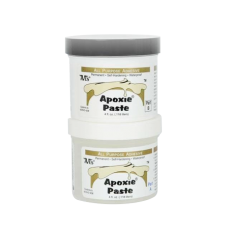 Buy Apoxie FixIt adhesive compound. Supplier of bonding materials. FIXIT® is a universal multi-media repair 2-part compound used to fill, bond, seal, customise, fabricate, and repair almost anything! This innovative product offers 3-D sculptability, and will cure to a rock hard waterproof finish without shrinking or cracking. FIXIT® is safe and easy to use unlike solvent-based epoxies. FIXIT® sets underwater, is UV resistant, petrol resistant fuels and can standheat up to 260˚C. Self-hardens, working time of 2 - 3 hours and 24 hour full cure. It has been proven effective on metals, plastics, fibreglass, glass, ceramic, porceline, wood, stone, masonry, cement, drywall, tile, foam, resins & more. It can be sanded, tapped, drilled, threaded, ground, carved, lathed, tooled or otherwise finished without chipping, cracking or flaking. FIXIT® can be painted wet or dry and accepts all types of paint. Uses include industry applications such as customising, fabricating, sealing, smoothing surfaces, mending, and filling leaks, holes, gaps & more. Fully suitable for outdoor applications.